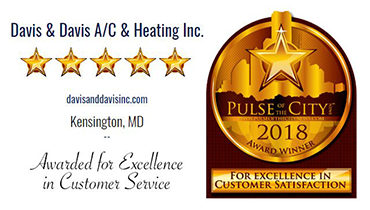 Davis and Davis Air Conditioning & Heating has been servicing Montgomery County Maryland, and Prince Georges County Maryland since 1966. Our many satisfied customers tell the story, but for your added peace-of-mind, you can rest assured that our professional staff has received the most up-to-date training available. Whenever you need us, we're here for all your heating and cooling concerns -- from scheduled maintenance & repairs to installations with a smile, we're always just a phone call away. Davis & Davis offers special preventative maintenance programs designed to deliver excellent protection for your heating and air conditioning system. Today's highly sophisticated and efficient heating and air conditioning equipment requires regular general maintenance for optimum performance. That maintenance is performed by our skilled factory trained technicians. Family Owned And Operated since 1966. (see Service Contract for charges). We've used them for years. Their quality and customer service has never changed over the years. They're top notch. Reasonably priced and great customer service. When you make an appointment, they show up on time. This is a company that I will always go to. My older furnace was out of warranty. I called on a cold, busy day. Service manager (Kevin) spent 20 mins on the phone with me troubleshooting, and then sent an expert tech (Craig) the same afternoon. I appreciate that they squeezed me in. I wouldn't use anyone else. Thank you! !